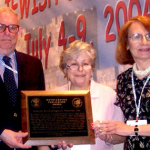 The International Association of Jewish Genealogical Societies bestowed four awards for 2004, recognizing outstanding individual and organizational contributions to Jewish Genealogy. 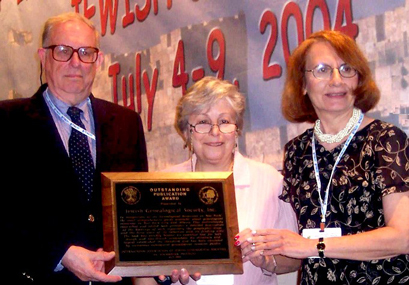 These awards were presented by the 2004 awards committee chairman, Judith Frazin, during the banquet held in conjunction with the 24rd IAJGS International Conference on Jewish Genealogy in Jerusalem, Thursday 8 July 2005.
in recognition of his ongoing devotion to building the field of Jewish genealogy. 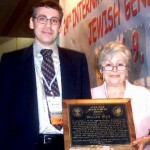 Along with his development of software supporting JewishGen’s vast network of Internet-accessible databases, he has contributed to the dynamic growth of Jewish genealogy. He has organized conferences and educational programs, produced journals, written books and articles, lectured extensively and has generously provided individual guidance to novices and experienced researchers alike. His efforts have encouraged and motivated genealogists worldwide. 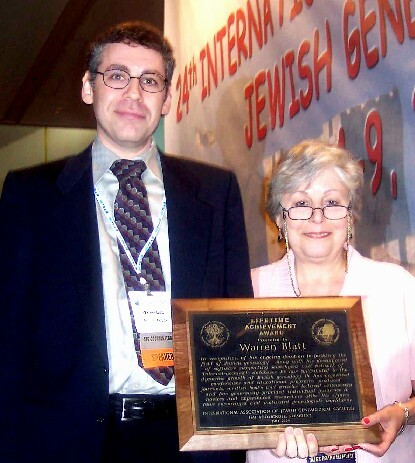 Warren Blatt accepted the award. In recognition of his major contributions to the specialized science of the origins and forms of proper names and surnames of persons as applied to the field of genealogy. He has authored numerous works which provide information, not only on surnames and given names, but also frequently provide clues as to the location of the family’s ancestral home. His four published works have become indispensable to genealogists worldwide. in recognition of the numerous projects undertaken within the Belarus SIG that have generated seventeen databases containing over 250,000 individual entries. Under David’s leadership and guidance, his cadre of volunteers has worked successfully with archives, translators and organizations to create a significant repository of Belarus records, documents and other information. The “All Belarus Database” is an outstanding, growing and readable accessible resource used by thousands of individuals researching their Jewish roots. Available at http://www.jewishgen.org/databases/belarus/. In recognition of its “Genealogical Resources New York” (2nd Edition), the most comprehensive guide available about genealogical resources in New York City and Albany. This meticulously researched and edited book provides a detailed description of the holdings of each repository, the geographic scope and the time span of its collection and its finding aids. The book has quickly become an essential tool for both Jewish and non-Jewish researchers. Its structure and layout established the standard and has been emulated by numerous subsequent genealogical resource guides. Estelle Guzik (editor of “Genealogical Resources in New York”) and Paul Silverstone (JGS, Inc. treasurer) accepted the award on behalf of the JGS, Inc.